If you just believe you can see the wonder of it all! Dream or reality? Innocent faith miraculously joins the two! Michael is a young boy who is seriously ill. 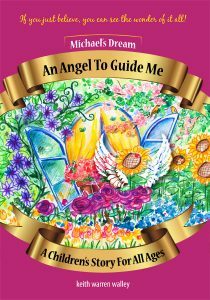 He is befriended by an angel who tells him a secret that can forever change his life. The choice is up to him. But what if it’s just a dream and he wakes up and finds nothing has happened? It’s a tough decision for a ten year old. Robert and Kathleen, Michel’s parents, play along but are really skeptical. They see this as a worsening of his condition. At least that’s what the family doctor, Dr. Barton, says. Michael knows this may be his last chance. Will he take the next step? Will he trust his friend? © Keith Warren Walley. All rights reserved.